Sesame Chicken Pakoras recipe by Nazia Nazar at DesiRecipes.com. Mix all the batter ingredients to a smooth consistency. Blend the chicken , onions, curry powder, salt , green chillies and mint leaves in a blender. Make small balls. Then heat the oil for deepfrying. 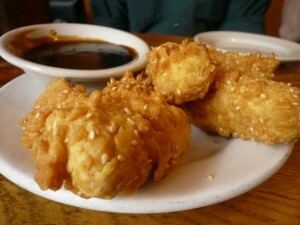 Dip the balls into the batter and roll them in the bread crumbs and sesame seeds , coating evenly. Fry until they are golden brown. Drain on kitchen towels. i want fish pakosa recipe. I would like a better explaination......recipe is messy with batter and filling mixed, what goes where?